We're fond off a bit of circuit bending here at GCHQ, we're no experts but we like to dabble a bit every now and then. The fuzz poles are just long bolts that create a different amount of distortion depending on how hard you hold them. Because the shafts of the bolts have a larger surface area than the heads (which I'd normally use) it creates a much wider range of fuzz/distortion/bit crusher effects. 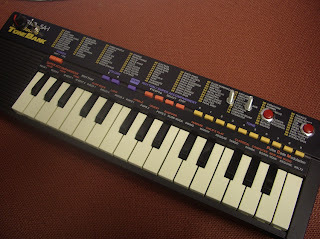 This SA-1 also reacts much better to the crash and glitch buttons than any others we've bent in the past - a few presses and it'll spew forth glitched loops or just plain noise. Lovely, if you like that sort of thing. You can find some detailed instructions and tips on bending an SA-1 on the forum of http://www.circuitbenders.co.uk/ an excellent UK based bending site. We've had a few bits and bobs off of Paul the guy behind the site in the past. Great stuff!